I dunno. With all due respect to Dr. Pollock, I'm still not buying the 'oxygen ear' theory. - Virtually all of the online literature that discusses 'oxygen ear' or 'middle ear oxygen absorption' quotes other websites, notably the US Navy Diver Manual, which talks about it but doesn't reference a source. - There is actually evidence against the idea. So I think there's more to it, perhaps due to high PO2 levels affecting the ME chemoreceptors, which regulate ME aeration, as A. Shupak (1994) suggests. 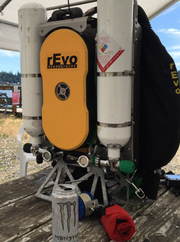 That would explain why the problem is worse after high-O2 dives and long rebreather dives. It's way worse with a rebreather. I have "crunchy ears" anywhere from a day to two days after a dive depending on deep, time and how often I've been diving. Your Eustachian tubes and ears get a workout on a dive. The number and intensity of equalization you go through are way beyond 'design parameters'. You could be reacting to some micro-trauma from adequate but not exceptional equalization. Everyone's ears are different. I need to go slowly, pay a lot of attention to equalizing, and sometimes ascend a bit and start over. If equalizing is AT ALL even....slightly....difficult you are putting some strain on pretty delicate tissues. It's actually kind of amazing we get away with it at all. On the drive home from a dive site, I often find myself popping my ears quite a bit. I just suspected it was because of habit to equalize and being more aware of the pressure differences. Irritation of the throat from diving might be worth considering. The gas we breathe is extremely dry, and there's so much more passing into our lungs. Because of this, the back of the throat can be irritated, resulting in the sensation to equalize more. Also, consider barotrauma from diving. I had bruising of my eardrum a few years ago and felt the need to frequently equalize until it healed. It's known that diving down just 6 feet from the surface without equalizing can cause some injury. 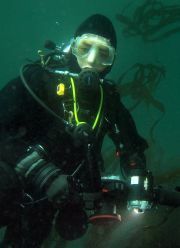 A lot of us may be having sub-clinical barotrauma each time we dive. You're right that the Eustachian tube does act like a one-way valve. It's easier for air to vent out of the middle ear, than to accumulate pressure. I doubt turning your head forces air in or out. There would need to be both a pressure difference between the throat and middle ear, and the Eustachian tube open for a equalization to occur. After every dive, for roughly the next 24 hours I need to keep equalizing. I'll equalize, and then a minute or two later I need to equalize again. What causes that? I heard a theory that your ears are still off-gassing, but I don't buy it. That would be a lot of gas coming out of solution and diffusing into your middle ear. My pet theory is that the eustachian tube is slightly inflamed or has some fluid in it, and that's making it act like a one-way valve. Every time you move your head it forces air out of the middle ear, causing a lower pressure inside.